Remembering one of the most influential leaders of the early Indian National Congress on his 100th death anniversary. June 30 provides an opportune moment for reflection on the early phase of the Indian nationalist movement, and how we remember and commemorate it. This day, 100 years ago, Dadabhai Naoroji, one of the most influential leaders of the early Indian National Congress, died in Bombay. He died, appropriately enough, a short distance from Tejpal Hall in Gowalia Tank, the venue where, in 1885, he helped inaugurate the first meeting of the Congress. During the last three decades of his life, Naoroji, known as the Grand Old Man of India, had been at the vanguard of the organisation. He presided over its institutional growth and, in 1906, established swaraj or self-government as the Congress’ ultimate objective. Even after ill health forced the octogenarian Naoroji into retirement in 1907, he found it difficult to completely discard the mantle of leadership. Naoroji interrupted periods of convalescence at his bungalow in Versova, then north of Bombay city, by writing letters to colonial officials in London, haranguing them for the “evil of the present system” of government in India. And, shortly after his 90th birthday in 1915, he caused panic amongst his friends, family members, and caregivers by agreeing to a request by Annie Besant – the British theosophist and champion of the home rule movement in India ­– that he take on the responsibilities of being president of her Home Rule League. Naoroji’s death in 1917 marked the definitive close of a chapter in the history of the Congress and Indian nationalism. In place of the moderate, constitutionalist approach that had been championed by early Congress stalwarts, a new generation of leaders adopted steadily more confrontationist tactics against British authorities. Indeed, in newspaper columns from 100 years ago, obituaries for the Grand Old Man jostled for space alongside coverage of the government’s internment of Besant, arrested on the grounds of “public safety”. Gandhi, meanwhile, took a brief pause from his first Indian satyagraha to organise a condolence meeting for Naoroji amidst the indigo fields of Champaran in Bihar. Besant and Gandhi were quick to recognise the towering legacy of Naoroji and other members of the early nationalist generation. But the tide of opinion swiftly turned. By the mid-20th century, many scholars and commentators were describing early nationalists as colonial “collaborators”. The early Congress was derided as nothing more than an elite debating club. These are quite unfair characterisations. Nevertheless, most early nationalists have today become obscure figures who hardly figure in public memory. Nothing – not even a gentle reminder from a senior historian of the nationalist movement – could rouse the modern Congress party to remember its founder, Allan Octavian Hume, in 2012, a hundred years after his death. Anniversaries for pioneering nationalist leaders Gopal Krishna Gokhale and Pherozeshah Mehta, who died months apart in 1915, elicited barely a whimper from the government or the public at large two years ago. 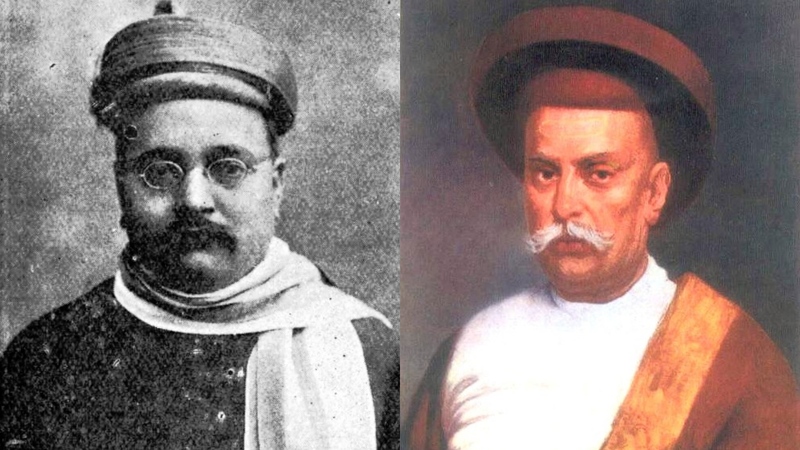 Independence movement pioneers Gopal Krishna Gokhale (left) and Mahadev Govind Ranade. This is unfortunate. Early nationalism was an absolutely foundational moment for the modern Indian nation – and, in the current hyper-nationalist political climate, it would be good to reflect on its leaders’ legacies. These leaders developed many of the ideas that continue to animate Indian politics. In the late 19th and early 20th centuries, Naoroji and his peers identified the alleviation of poverty as the central challenge for the state, affirmed their commitment to a pluralist democratic political structure, and steadfastly warned against communal and majoritarian instincts. They established solid alliances with socialists, anti-imperialists, and political reformers around the world. All of this begs the question: how should Naoroji and his fellow early nationalists be commemorated? On June 30, statues of Naoroji will be garlanded and a few homilies and paeans to him will be offered at public events. These activities serve a certain purpose, but they fail to offer proper commemoration. India’s culture of public commemoration remains strangely Victorian. This is due, in part, to the lasting influence of the Scottish intellectual Thomas Carlyle, whose 1840 work on hero-worship gained wide currency across the British Empire. Hero-worship was “submissive admiration for the truly great”, Carlyle lectured. It was “the transcendent admiration of a Great Man”. Carlyle was against the objective analysis of such heroes: “critics of small vision”, he averred, must not be allowed to dim their glory or interfere in their veneration. In many ways, public commemoration in India still seems beholden to Carlyle’s dictums. Deceased leaders are deified and a web of hagiography is spun around them. Statues are cast in heroic poses – indeed, India has recently embraced the philosophy that truly heroic leaders deserve super-tall concrete behemoths. Contemporary political figures eulogise their greatness. Consequently, we lose track of what really made these leaders important: their ideas. Bereft of any reference to their ideas and philosophies, effusive praise eventually loses its resonance and the hero is duly forgotten. In place of statue building, chowk renaming, and other such token efforts at commemoration of past leaders, it would be much more meaningful to advance their ideas. This is especially the case for early nationalists, who contributed to a particularly fertile period of intellectual development in India. To cite one example, early nationalists were united in their desire to promote high-quality mass education, an objective that modern India is still struggling to achieve. Naoroji, Gopal Krishna Gokhale, and Mahadev Govind Ranade, an important economic thinker and leader of the Congress, all began their careers as college professors. The Grand Old Man, who in his youth opened some of Bombay’s first schools for girls, was a tireless advocate for the spread of learning. As early as 1871, he demanded that the British administration in India institute a “comprehensive plan of national education”. Many years later, Pherozeshah Mehta, shocked that the Bombay Presidency’s director of public instruction had declared 85% of Indians “beyond the pale of education”, railed against the government’s indifference towards the intellectual development of its subjects. Gokhale, meanwhile, regarded educational policy to be “one of the greatest blots” of British rule. In 1911, he authored a bill to introduce a policy of compulsory primary education in India – which, of course, the British government rejected.